The theory test for car drivers & motorcyclists was introduced by the DSA in July 1996. It is designed to to improve the safety of newly qualified drivers & riders by making them think carefully about the right attitudes needed to drive safely on today's busy roads & reduce the risk of accidents. You take your theory test on a computer at one of the local Driving Standard Agency centres in your area. You will have to answer 50 multiple choice questions and have to gain a minimum of 43 out of the 50 questions to pass. Candidates with dyslexia or other reading difficulties will be able to take the theory test with an English or Welsh language voiceover. In November 2002 the theory test was changed, in addition to answering 50 multiple choice questions you are also tested for hazard awareness perception skills. You will sit this part of the test on completion of your theory test. You will need to pass both elements at the same sitting to pass your theory test. 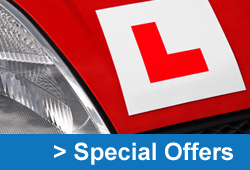 The current cost for the theory test and hazard perception is £23.00. On completion of the theory test you will then have a break of three minutes before starting the hazard perception test. To take a practise theory test click the Theory Test Pro link below. For more information on the theory test watch the official driving standards agency video on the right hand side of this page.